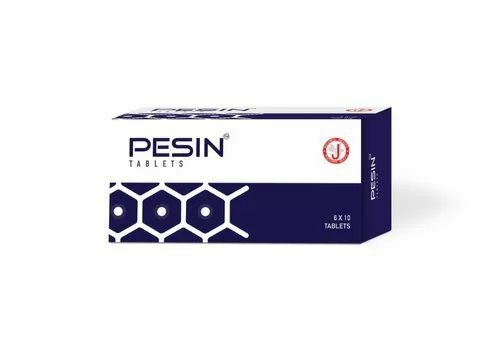 Our product range includes a wide range of pesin tablets. Smilax chinensis contains anti mutagenic agents that knock out all toxins and antigens. Embelin in Embelia ribes offers effective antioxidant benefit. Radio sensitizing effect of Withania somnifera enhances the benefit of Sun in the treatment of Psoriasis. Elettaria cardamomum is an effective coolant and shows anti-inflammatory & anti-oxidant effect. Protects glutathione, the naturally occurring antioxidant in our body. Linga chenduram increases prognosis collectively and individually. Conch turbinella rapa contains Calcium carbonate essential to address Psoriatic conditions. Adults: One tablet in the morning and at night after food with milk or water. Children 5-10 years: One Tablet once a day after food with milk or water.